I have been a lover and an amateur collector of African fabrics for many years and have a treasured piece of Kente cloth which I bought from a West African man who used to come to my shop with a suitcase of trade beads and occasionally textiles. For an interesting discussion of Kente's history - see this article. From him I bought my first Bogolanfini, (translates as Mud cloth) and Kuba cloth as well. I have bought several pieces of Kuba cloth since and photographed them. See this page for my Kuba photo thumbnails linked to larger images. My first awareness of African-American quilts as a category of quiltmaking came several years ago when Eli Leon, collector of African-American quilts and author of several books and show catalogs, came to me to help him solve a problem dating a quilt with questions about the dyes on it. Eli had received a Guggenheim award several years ago to aid in his research and collecting of African-American quilts. I later read one of his well-researched books and saw how he drew parallels between the quilts made in the African-American community and the fabrics which I knew and loved from Africa. I was hooked! (He also draws parallels with jazz, another of my favorite things, and African-American quilt improvisation styles.) The combination of elements of traditional African textiles with the blocks and patterns of traditional American quilt patterns can result in a joyful finished quilt. Eli Leon's collection of quilts by Rosie Lee Thompkins (see her list of works and exhibition history) was exhibited in June-August, 1997 at the University of California Art Museum in Berkeley and many quilters traveled to see it. A catalog from that exhibit is available. A review of the exhibit, Greatness Near at Hand by Lawrence Rinder, curator at the UCB Art Museum makes interesting reading. Eli, a personal friend of the quilter, writes an excellent article about her inspirations and methods of working in Shadows of Divine Perception. A good list of references from this exhibit article may be useful if you want to find more information about African-American quilts. J. Baas' Acknowledgements for the show is interesting reading, too. An earlier exhibit, also of quilts from Eli Leon's collection, was called Who'd A Thought It? and it traveled to several museums around the USA. The catalog was published by the San Francisco Craft & Folk Art Museum with an introduction by Robert Farris Thompson, an African-American scholar. A marvelous article with excellent photographs in an issue of American Quilter from AQS in Paducah, KY (winter 1997, Vol. XIII, no. 4) called Joyful Improvisations, the Quiltmaking of Anna Williams is a must-read if you are intrigued with African-American quilts. Nancy Crow helped to introduce Anna Williams to quilters in the USA and Ms. Williams' influence on Nancy Crow's work (see her quilts here) is apparent when you see her quilts. The vibrant, string-pieced quilts have a freeform spontaneous quality that makes them exciting and cheerful. Anna Williams cuts her pieces freehand and the sight irregularity to the shapes and forms gives them an extra verve. Nancy Crow said of Anna Willams: ""I think she is going to be considered one of the finest quilt makers of this century." Read about the Reynoldstown Quilters of Atlanta, Georgia and the social aspect to their quilt group. These quilters are in their 70's and 80's and began quilting together 5-6 years ago. An exhibit detailed online, entitled From the African Loom to the American Quilt is interesting reading and includes photos of several of the quilts from the Tuscaloosa, Alabama quilters featured in this exhibit. I found a fascinating article about Randolph, Arizona and the quiltmakers there. It combines history, So. Arizona folk art and quiltmaking in the way we all find fascinating. One of the most interesting articles I found online discussing traditional quilting patterns -plus- African-American quilts -and- freeing up by improvising during quiltmaking is Geometric Patchwork, Renewing Its Viability as Art by Catherine Jones as published in the Virtual Quilt series. Harriet Powers, born a slave in Georgia, is famous for her applique quilts, 2 of which remain and are in the Smithsonian. Her photo and famous quilt are shown here. Another slave, Kadella, said to have been a Barbados princess we see a Euro-traditional applique quilt. Another page tells the story of Jane and Rebecca Bond, slave and mistress in Kentucky, who were very close and quilted together. Michigan State Univ. 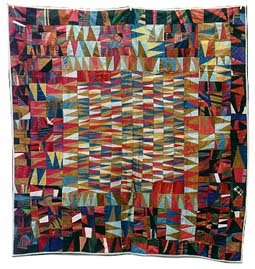 has a wonderful article on African American Quilts with many images. The Art Museum shows a Slave Quilt and An applique quilt block made by a slave about 1860. Many prestigious museums are recognizing the beauty and tradition of African-American quilters. A recent exhibit at the Renwick Gallery (part of the Smithsonian) in Washington, DC featured many modern quilters' works. Traditional Quiltmaking in Louisiana - by Dr. Susan Roach, Regional Folklorist at Louisiana Tech Univ., this article first appeared in the 1992 Louisiana Folklife Festival booklet. Made by Men - Quilts by African-American male quilters from an exhibit at U. of Maryland. Click on each man's name to see a quilt. Faith Ringgold is an author, painter, quilter and professor. She now has her own Web page and you can see her wonderful work, such as her Tar Beach and Dancing at the Louvre quilts. Here, on another site, is her Flag Story Quilt. Dinner at Gertrude Stein's is a favorite of mine. African-American Quilters "Drawing on Tradition" - 10 quilters and 20 quilts in an exhibit. Black Heritage vibrantly shown in Quilts, an article in San Diego State Univ. 's paper. Quilts from Artisans - a spectacular satin quilt from a family in Baltimore, 1920-30. Rosie Allen, a quilter from Louisiana, loves to piece Trip Around the World quilts. Her husband, David, is a master hickory walking stick carver. A wonderful Ethnic Quilt site by Gwen Magee with a wealth of information. Take some time to explore! An emailed newsletter sent approximately twice a month. It's a short email to let you know when new articles are added here. Click to send me an email to sign up at the address here. I share these addresses with no one.